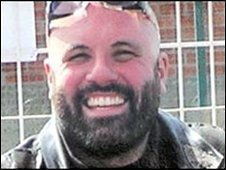 Another member of biker gang The Outlaws has been found guilty of murdering Hells Angel Gerry Tobin on the M40 in Warwickshire last year. 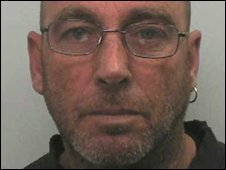 Malcolm Bull, 53, of Milton Keynes, was also found guilty of a firearms charge at Birmingham Crown Court. Simon Turner, 41, of Nuneaton, and Dane Garside, 42, of Coventry, were convicted of murder on Monday. Sean Creighton, 44, of Coventry, has admitted murder. The jury has not reached verdicts on three other men. It was sent home and will resume its deliberations on Wednesday. Karl Garside, 45, Dean Taylor, 47, and 46-year-old Ian Cameron have all pleaded not guilty to murder and firearms charges. Mr Tobin, who lived in Mottingham, south-east London, but was originally from Canada, had been riding back from the Bulldog Bash biker festival, held near Long Marston, south Warwickshire, when he was killed on 12 August. The trial has heard the 35-year-old was shot by members of The Outlaws simply because he was a "fully patched" member of the rival Hells Angels gang. Two bullets were fired at him from a Rover car which pulled up alongside him on the M40. One bullet hit him in the head and the other struck his motorbike. The trial heard Bull was the gang's "spotter" on the day of the murder. The prosecution said he was in a separate car in a separate location and was watching who was leaving the Bulldog Bash, in co-ordination with other members of the gang. This information was then used in the execution of the murder. The trial heard Bull was the treasurer of the South Warwickshire chapter of The Outlaws. Dane Garside was also found guilty by a majority verdict of possessing an illegal firearm.